If you have even a minimal amount of experience with guinea pigs, then you are familiar with their habit of running and hiding when you enter the room. This can be discouraging, especially when you love your new pet and you just want to play and get to know him. The key to getting your guinea pig to like you is to develop a predictable routine. This is the surefire way that can help greatly toward bonding with your pet, because then he gets to know what to expect and he will then learn to trust you. All animals have this basic instinct, it gives them a sense of being in control over their environment and therefore they feel more safe and secure. The most important things to animals are their basic needs; food shelter and safety. Once you meet these needs you're in for good. Balance and structure are key to making friends with your little furry friend, and you will be rewarded with a fun little companion when you follow these tips. 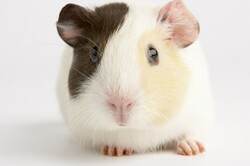 The next important step you can take with your guinea pig is to handle them frequently. Not so much the first week after you bring him home, as this is a time of adjustment and your new pet is most likely frightened by his new environment. The best thing to do at this point is to just feed him regularly and keep the cage clean. After the period of adjustment you can go ahead and start picking him up every day. Just scoop him up firmly and cradle him gently against your body while he rests on one of your arms. In this position your pet is safe and secure and he is less likely to bolt and possibly fall to the ground. Guinea pigs love to have 'free range' time outside of their cage and so allow him to run around and explore. I don't mean to let him run around the entire house; choose one secure room for his playtime. Be sure that there is nothing that can cause him injury such as a hole that he can fall into or electrical cords that he can chew. Set out some boxes for him to run into for fun or toys such as cardboard tunnels or a blanket to crawl around under. You must supervise your pet during this time, unless if you are completely and positively sure that everything in the entire room is safe for him to explore. As they are rodents you must know that they like to chew and taste everything and so keep this in mind as well when you are guinea pig proofing the play room. Humans bond over food by preparing the meal, setting the table and discussing their day while they eat. Guinea pigs are much the same, they like to have breakfast and supper served predictably and then they know that they can trust you because you are the person bringing the good stuff. Nobody is trying to harm them during this period and they get to enjoy some tasty treats. It is predictable and safe and so you, the meal time provider are a friend. Be sure to talk gently to your pet as you feed him and the sound of your voice will also become a source of comfort. Offer pellets and fresh vegetables such as romaine lettuce, sliced tomatoes and cucumbers which are favorites of this animal. Some fruit is okay but not every day as once or twice per week is enough sweets for them. Timothy hay is the most important food to give guinea pigs every single day if nothing else. If you follow a routine of feeding in the morning and feeding in the evening, your guinea pig will learn to look forward to these times and as a bonus, look forward to seeing you. As the person who brings the food in a timely fashion, you are now the hero and a big highlight of his day. Keep your guinea pigs cage clean. It is important for your nose as well as their health for you to do so. Every morning or evening, whichever is most convenient for you, scoop out all of the uneaten vegetables and clean out the piles of poop that have accumulated. You will notice that they prefer to use a certain corner of the cage for a bathroom, though not strictly as there will be stray leavings all over. As long as you clean out the most obvious dirt you are good to go. Once per week dump out the whole cage and use warm soapy water to clean the bottom tray and wipe the bars clean so that you can lay down fresh newspaper and hay for them to enjoy. Guinea pigs are not toys. Don't allow younger children to be alone with them as they can inadvertently cause an injury to the small animal. Teach your older kids how to handle them properly so that they are considerate of this living creature. Respect is also key to having your guinea pig trust you and other family members. Do You or Have You Ever Had a Pet Guinea Pig? No, but after reading this I want one! Had one once, it was the best thing ever! Within one month or two you will notice that your little piggy is dancing in circles when you come with a meal or to play. He will emit a high pitched noise known as a 'wheek'. This is a noise that lets you know they are hungry or excited to see you. Now isn't that a better reception than when he runs and hides? I'm not saying that sudden noise or movement won't cause them to jump into hiding anymore, as this behavior is ingrained in their nature. When you follow a routine, your pet will be happier and more welcoming to you and your company and you will both have a more rewarding time together. The really hairy one, right? Fascinating! I used to raise Peruvians. Loved the forelock. Oh, you have a pet g.p.? So adorable how he waits for you! I'm glad you mentioned the extra information in your comment which is so useful for people to know.